← The Bard On Trial: Did Shakespeare Kill The Heroic Ideal? Thanks, Toni, for your insightful comments — I second them! 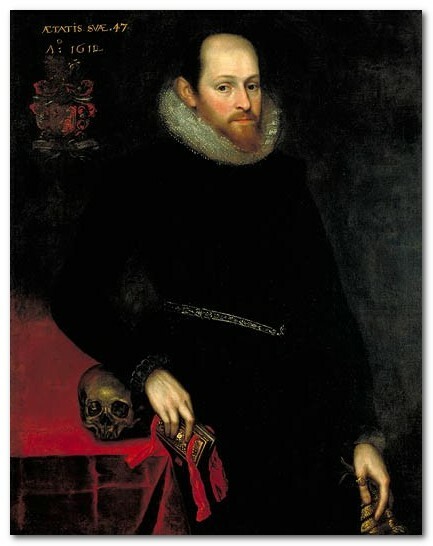 Since Stanley Wells and the Shakespeare Birthplace Trust identified the Cobbe portrait as definitively Shakespeare in 2009, on what can only be described as dubious grounds, it has become the standard representation of him on many websites, posters, articles and the internet, invariably with no indication as to its provenance or authenticity. There seems to have been a deliberate policy to present Shakespeare as a well-to-do and wealthy man of significant status, not to say as a remarkably handsome chap, in his later years. Since this particular image is currently dominant in the representation of Shakespeare, the known representations of him (the Droeshout engraving; the Trinity Church monument) are being marginalised, while other possible representations, such as the Chandos portrait (containing the date 1588 and the age of the sitter as 24, making his birth year 1564), are now virtually entirely neglected. Shakespeare is always political. Each age reinvents him in their own image and rewrites his history so that it conveniently fits with whatever those in control of the industry want people to believe. Since US academia and business now own the vast majority of actual Shakespeare-related materials, such as the first folios, and are major players in key Shakespeare institutions in the UK (The Birthplace Trust; The Globe), it is inevitable that the image projected of Shakespeare matches how they want him to be portrayed, as the man of modest means becoming the brilliant cultural entrepreneur made good. 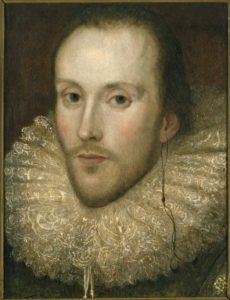 Shakespeare’s image has been appropriated and manipulated in one way or another since the Restoration, literally and metaphorically. It is up to contemporary academics, critics and audiences to draw attention to the implications and outcomes of such manipulation, which inevitably involve the suppression of material and information that doesn’t fit with the dominant narrative. This is not a matter of somehow reclaiming the ‘true’ Shakespeare but of applying historiographic and critical perspectives to analyse, challenge and deconstruct the apparent givens related to Shakespeare today, sold to the world as fundamental truths with little or no evidence to confirm their veracity.